Al Rustaq is a city in the South Al Batinah region, surrounded by the central Al Hajir mountain range and Aflaj date palm groves. It came to Omani history forefront when Imam Nasser Al Ya’rubi started his conquest to unify Oman & repel the Portuguese from the country in 17th century. Al Rustaq was also once the capital of Oman, and it has many attractions that should make it a much bigger tourist attraction. It is an area of healing warm springs, the most notable being Ain al Kasafa. Its waters runs at 45°C and are regarded as a cure for rheumatism and skin diseases due to its sulphur content. There are three popular wadis to visit: Wadi Bani Ghafar; Wadi al Sahtan and Wadi Bani Auf. In addition, the mountains are pitted with caves such as Al Sanaqha Cave with its own subterranean springs. The wadis (valleys) of the surrounding area are well worth exploring and are known for their natural springs: Al-Kasfa is the most popular place to enjoy the therapeutic properties of the warm, sulfurous waters. Natural irrigation makes this a fertile fruit-growing region which is also known for its excellent honey. Al Rustaq is famous for two impressive and historically important landmarks: Al Hazm Castle and the imposing Al Rustaq Fort. Al Hazm lies about 20kms from Ar Rustaq on the road leading back to the Batinah Coast. 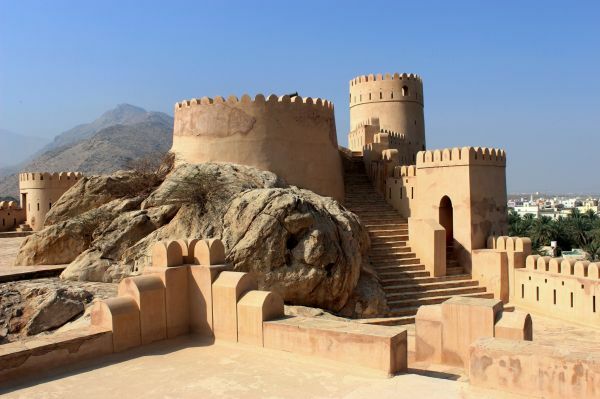 The massive Al Rustaq Fort, a much older fort dating back to the 13th century, is near the city market and be can be seen from the surrounding hills. The Wahiba Sands is a large desert area just four hours drive from Muscat. A surprisingly wide array of flora and fauna call the sands home where rolling sand dunes of many a desert film location. The most impressive dunes can be found in the north east, some reaching an enormous 300 feet high. Wadi Shab is a canyon type valley with flowing water throughout the year. A long walk past the green grass, banana and mango trees along the narrow winding, old rock paths will bring you to a series of streams and pools. After wading and swimming through some gentle ponds your extreme adventure begins. Musandam Governorate of Oman is on the Strait of Hormuz, separated from the rest of Oman by UAE east coastline. The part suitable for sea navigation falls within the territorial waters of the Sultanate, which made Omanis shoulder a huge responsibility in organizing navigation in this Strait since the old ages.